I'm renting every year villas in Bali. 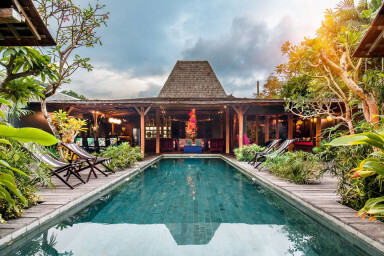 I've rented my last villas managed by The Bali Agent company, and i have to say that the service provided by Benjamin and his staff is reactive and efficient. The villas rented (ruku ruku, madah, bumi) are charming, quiet, and got nice design with good vibes. I am always renting with them now. It was a excellent stay at Villa Ruku Ruku and even every moment of package arranged by Bali Agent. From pickup at the airport to drop till end everything was managed well and organised. Villa itself is very beautiful with private pool Living room bed room............ with great interiors. Cleanliness at the villa is remarkable. Special mention must be made of Dolla who made all the efforts we had a very good welcome............. even better was care take Wyana who left no stone unturned so that we could have a very very comfortable stay . Special thanks to our driver Agum........ who was very helpful, informative and was able to speak reasonable English he showed us all the places as desired by us. Overall special thanks to the boss ...............THE BALI AGENT himself Mr. Bejamin a thorough gentleman and an excellent organiser and planner.......... hope our friendship grows. All in all i would recommend this to every one and enjoy the amazing villa experience at Bali.........................Will love to visit again. We enjoyed a wonderful time at the magnificent villa. Even though the water was not running on our arrival day, the problem was fixed within a few hours and we didn't have any other problems at all. We especially liked the great and friendly staff, Ray was a wonderful "house mother" and organised everything we asked for exceptionally well! Thank you very much, we would recommend your place anytime. Villa Bumi was a gorgeous place to stay. And our hosts, Benjamin and Dolla, were excellent. They organised our airport transfers, accommodated a 1am check in and had groceries in the fridge for us on arrival. They had contacted us before our stay to give us detailed instructions for when we arrive in Bali and how to find the driver, which was very ressssuring given the airport is such a hectic place. Our housekeeper, Wayan, was lovely and very attentive to us and to making sure the place was always tidy and maintained, without being obtrusive or invasive. We always felt we had our privacy. Dolla, our host, was only a phone call away to help us organise drivers, massages and anything else we needed. Dolla provided us with a local prepaid mobile phone which was a fantastic value add. The villa itself is beautiful, serene and well kept. It is in a quiet street with really lovely neighbours. We went during the new year period so it was a bit louder than I imagine it would be otherwise (with fireworks). And it is not close on foot to the tourist strips, but for us this was a bonus because we came for a quiet family holiday. I would definitely come back to Villa Bumi. Many thanks to the host team for accommodating us. I can not rate the villa and the staff highly enough. Nothing was too much trouble and they were constantly on hand to assist with anhinga. The chef is an amazing cook. The villa itself is large and beautiful. There was 11 in our party and you could easily some quality time apart in all the different breakout areas. It was cleaned to a high standard and was constantly cleaned throughout our stay. We will 100% be going back and will be talking about it for many years to come. The villa looks even better than the pictures. Very pleasant experience! Highly recommend we will definitely be returning. Thanks Dolla and Benjamin!